The game that defined the modern Endless Runner genre. 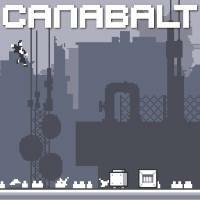 You play as an anonymous runner in a grayscale pixel-art cityscape fleeing some kind of invasion. Avoid obstacles and pitfalls by jumping and survive as long as you can. That’s about it, and the game would be considered a very minimal endless runner (albeit one with a distinctive and enjoyable aesthetic) if released today. This is the core on which countless successors have built their gameplay, but here it is pure and simple - and at the time, it was revolutionary. What is interesting is that not quite all of this game’s formula was copied by its successors. This is the only runner I know of where speed increases over time but the player can choose to hit certain obstacles (boxes) to slow down. This creates a risk/reward tradeoff since going faster means your score rises more quickly but you may not be able to react to danger in time. Later runners have largely abandoned this, though the better ones find their own ways to introduce such tradeoffs and present the player with interesting decisions and not just test their reflexes. I Stopped Playing When: After probably less than an hour when I stopped getting consistently better and lost interest.